Using your vehicle to haul heavy cargo or tow your camper, boat, or work trailer can create a lot of sway and make controlling your vehicle more difficult and you can have a much harder ride. SuperSprings SumoSprings overload bump stops aid your factory suspension to eliminate the swaying, while improving your control & reducing any jolting or bounce in your ride! Heavy loads make it easier for your vehicle to bottom out or bounce as you go down the road. SumoSprings replace or assist your factory bump stops to help prevent this from happening. The proprietary closed cell urethane that SuperSprings uses in their SumoSprings provides progressively stiffer compression, making your ride much more stable & comfortable. SumoSprings come in three different styles to fit your situation. You can choose from Solo, Maxim, or Rebel series. All components are made from the same durable, long-lasting material but the differences lay in the way they attach and perform. Solo series are a one piece unit that mounts only at one end and is the original SumoSpring. Maxim series bump stops are a one piece unit that attaches at both the top and bottom, providing more control and the Rebel series offers a 2-piece design that mounts on both the top & bottom. This design allows unlimited vertical travel. Installation is super simple since there are only a few bolts to tighten on most vehicles and no special tools required. Detailed instructions are included specific to your particular vehicle. You should have no problem getting these overload bump stops added in less than an hour. 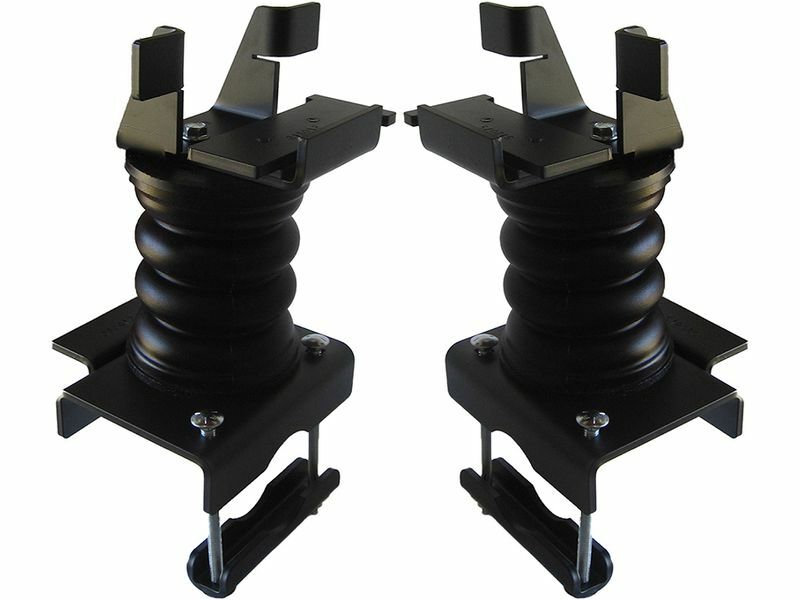 Get yourself better control and enhance the load carrying capacity, handling and towing of your truck with SuperSprings SumoSprings overload bump stops. You can be proud to know they are made in America, so go ahead and get yours today! Your SuperSprings™ SumoSprings are covered by the limited warranty explained below that gives you specific legal rights. This is the only warranty made in connection with your SumoSprings. SuperSprings™ neither assumes nor authorizes any vendor, retailer or other person or entity to assume for it any other obligation or liability in connection with this product or warranty. Subject to the terms, exclusions and limitations herein, SuperSprings International, Inc. Warrants to the initial retail or fleet purchaser only that its SumoSprings suspension stabilizer shall be free of defects in material and workmanship for two years. This limited warranty extends only to the initial retail or fleet purchaser with respect to use upon the vehicle the product is first installed. The term of this warranty shall be measured from the date of purchase. SuperSprings™ reserves the rights to: (a.) require claimant’s proof of purchase as a condition of this limited warranty, (b.) make future revisions to its limited warranty without prior notice. ALL OTHER EXPRESS OR IMPLIED WARRANTIES INCLUDING MERCHANTABILITY OR FITNESS FOR A PARTICULAR PURPOSE ARE HEREBY DISCLAIMED. Your warranty doesn't cover damage arising or related to any vehicle, product, or component combination other than the SumoSprings suspension stabilizer. Your warranty further does not cover vehicles, products or components supplied by us or others that SuperSprings International, Inc determines to have been damaged by or subjected to the following. - Vehicle use in excess of GVWR combined vehicle weights/ tow ratings or other OEM design specifications or limitations. - Normal wear and tear, deterioration of spring shape or rating, alteration or failure to maintain. Scratches or defects in product finishes (powder coating, paint, etc.) or damage due to shipping. - Misuse, including products used other than as recommended in the current SumoSprings application guide or the instructions. - Racing or other vehicle competitions or contests. Accidents, impact by rocks, trees, obstacles or other aspects of the environment. Remedy Limited to Repair / Replacement. Upon inspection, your item will either be repaired or replaced with product or parts covered under this limited warranty. Customers requesting warranty consideration should first contact the independent distributor from whom you purchased your SumoSprings to obtain a Returned Goods Authorization number. All removal, shipping and installation costs are customer’s responsibility. If a replacement part is needed before yours can be returned, you must first purchase the replacement part. Then, if SuperSprings™ deems your part warrantable, you will be credited the purchase price. Your warrantor is SuperSprings International, Inc. In consideration of the purchase price paid, neither SuperSprings International, Inc. or any independent SuperSprings™ distributor are responsible for any installation or removal costs, time loss, rental costs, or for any incidental, consequential, punitive or other damages you or third parties may incur in connection with any product purchased. Your exclusive remedy hereunder for covered parts is repair/replacement as described above. This Limited Warranty gives you specific rights. You may also have other rights that vary from state to state. For example, while all implied warranties are disclaimed herein, any implied warranty required by law is limited to the terms of Limited Warranty described above. Some states do not allow limitations of how long an implied warranty lasts and /or do not allow the exclusion or limitation of incidental or consequential damages, so the limitations and exclusions herein may not apply to you. Installing your new SumoSpring bump stops will be simple and easy. They install with no special tools and for most vehicles, it should only take about an hour from start to finish. If you would like any additional information about this or any other SuperSprings suspension component, don't hesitate to give our customer service department a call any day of the week.